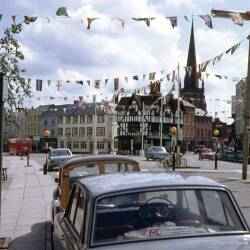 Colour photograph of an aerial view of High Town, Hereford c1976. St Peters Church is at the bottom right and following the road into town you pass the Old House. The clock tower in the center of the photo is the entrance to the Butter Market, with Midland Bank on the corner of High Street/Widemarsh Street. 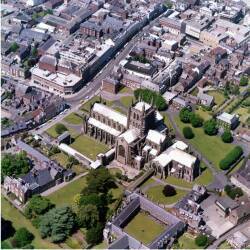 All Saints church is in the top left of the picture.